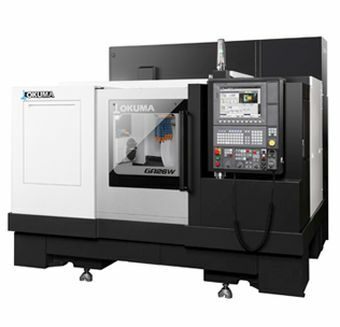 Okuma's new GA26W high speed, compact grinder is now equipped with the intelligent OSP-P300G CNC control. Okuma's open architecture OSP-P control runs on a Windows®-based platform and fully integrates the machine, motors, drives and encoders, allowing for enhanced machine performance and true customization to suit particular machining needs. The Easy Operation control and touch screen increase efficiency by letting users easily and quickly toggle between machine operations, programming and wheel preparation screens. At IMTS 2016 this machine will be shown grinding a steel shaft. The innovative wheelhead traverse structure gives this CNC grinder a solid, compact footprint that saves valuable floor space while the user-friendly design allows various workpieces to be loaded effortlessly for easy automation in high production environments. The extremely rigid foundation paired with Okuma's hydrodynamic wheel spindle allows for heavy-duty grinding.